1. Brush chicken breasts with olive oil, season with salt, pepper and chilies. Place on grill on MEDIUM, and turn only once until breasts are cooked thoroughly. Slice thinly. 2. Place whole red peppers on grill to cook until hot, yet not completely cooked. Cool slightly, then thinly slice the peppers, green onions, and mushrooms. Toss with remaining olive oil, red chili, coriander and salt and pepper. Pour out excess oil, cover, and set aside. 3. Brush the pizza crust with chili oil. Place chicken evenly over the crust, then sprinkle with vegetables and top with shredded mozzarella cheese. 4. Cook pizza on a preheated barbecue on LOW for 5-10 minutes or until the base is crisp and golden and the cheese is bubbling. Slice and serve hot. Now, if you ask most dads what they want this year for Father's Day, and they will humbly say spending time with the family is enough for them. While that may be true, we can make Father's Day extra special this year by spoiling dad with the perfect gift and a delicious homemade dinner. Start by getting dad a present he will really appreciate. No “socks-and–tie” nonsense this year: Broil King's Stone Grill Set comes with a high grade 1.2 mm stainless steel cradle with oversized 10 mm stainless steel handles. The set also comes with a resilient 13 inch pizza stone that is able to withstand rapid temperature changes, a high grade stainless cradle with integrated thermometer, and a wooden pizza peel. 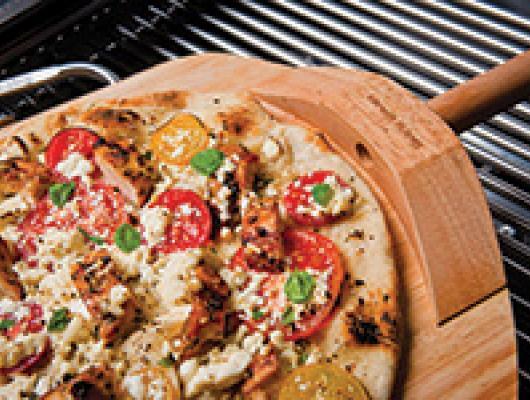 Here is a recipe that will allow dad to test out his new barbecue accessories. Dad is thrilled with his grilling accessories and the family spends the night together over a delicious pizza – sounds like the perfect Father's Day.